What my Collection looks like in all in one place. my Collection has only got bigger in this time and i dont think i could do this now. it would not all fit in 1 place. how many set's can you name. 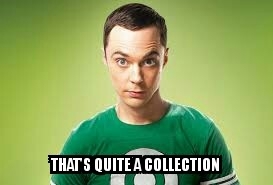 so i get the sheldon seal of aprovel? hehe. come on i know there are other on here who have way more then me. 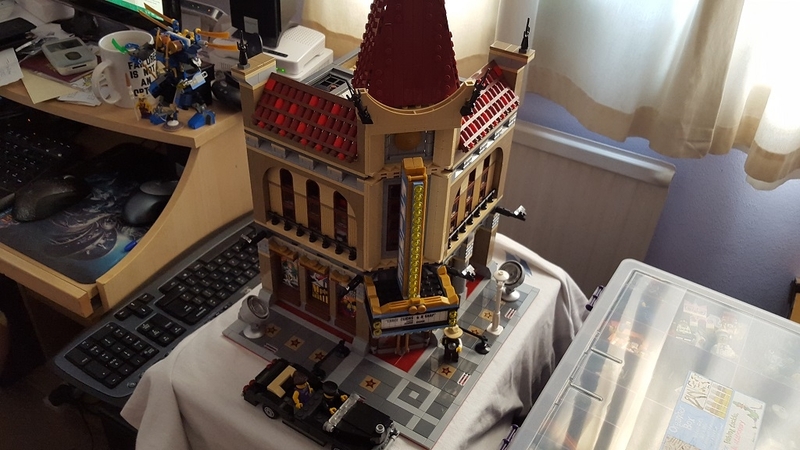 I'm always super excited when I take my two boys round to a friends house and the parent goes 'Oh, you like Lego too (to the boys), Soandso has loads let me get it out'. I'm there, waiting with bated breath for this epic collection and to start the building, when out comes a shoe box half full of a mixture of Lego and clone brand stuff. It normally isn't even a big shoe box! Argh! I can't be the only one with a collection for my children that constitues 3 huge crates, surely?! (Probably not the best place to get an honest response to this). No wonder children always want to come to our house. 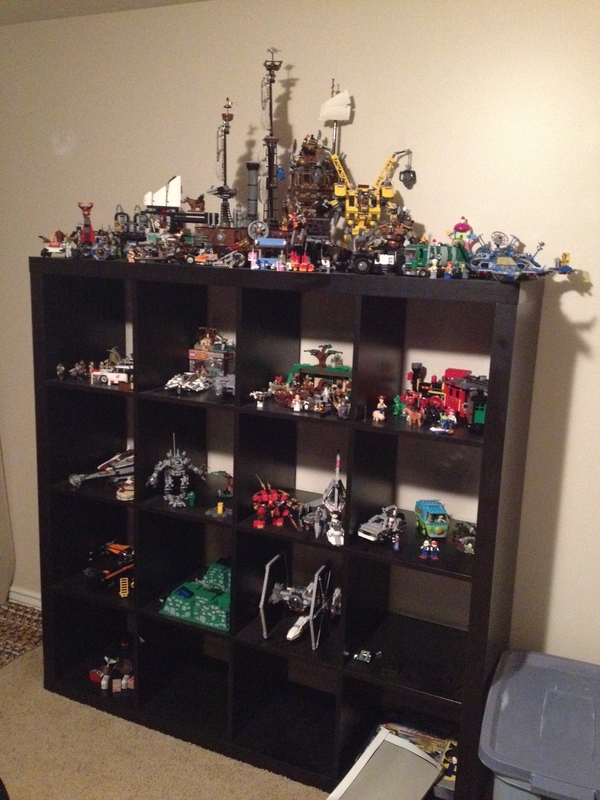 I might have to take a new photo or two of my Lego room/back bedroom. 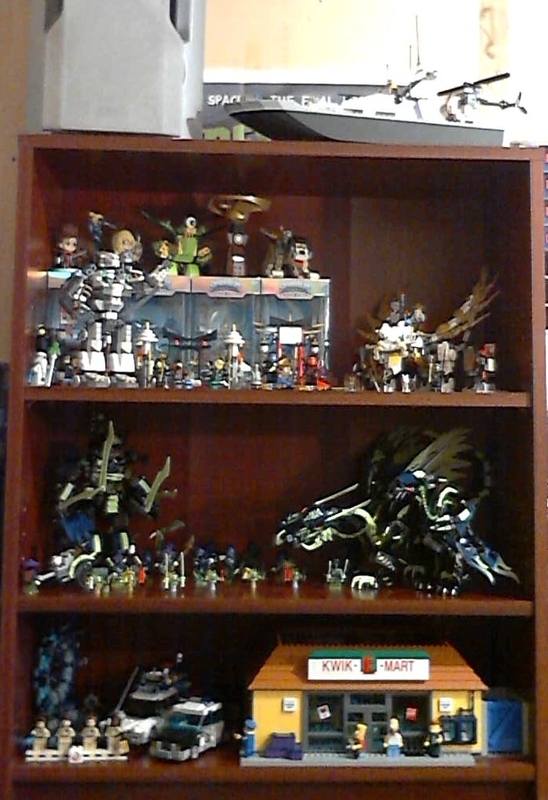 I do have some sets that I need to take apart though, as I don't have enough space to display them all. They include Metalbeard's Sea Cow, Ferris Wheel, UCS Sandcrawler, and the Sydney Opera House. How on earth I'll fit the 10,000+ pieces from all that into my collection, I'm not quite sure. I suspect I'll need quite a few more boxes. I do have a lot, but I know of others who have far, far more. I play that game pretty much weekly with job lots, and I think I can name pretty much every set there. I also find this funny that this is about the same size as most job lots I get, and I have no idea why that is. Also, the timeline of these sets seems strange- late 90's through today, yet missing several years here and there? Did you get some from job lots or something? You should see the people trying to sell their "huge collection of lego's" and such. I once had one that sounds just like what you're describing, yet still wanting more than MSRP on what they had. not one of them sets is 2nd hand. all of them was got by me. the only 2nd hand set i have is missing parts so was not in this image. the gaps are me not getting any lego at that time. Argh! I can't be the only one with a collection for my children that constitues 3 huge crates, surely?! Yeah, I give you props for having all of your sets built. I'm sure people have far more, but all put away and not on display. Just like that one guy claiming some world record for LEGO set built in his home.. My guess is there are a few folks in this forum alone that could easily challenge him on that claim. I don't have half of mine built and I'm out of room. Is it a problem if you're out of room for un-built sets? 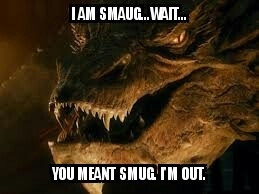 Wait, who exactly is supposed to be smug? Just out of interest, do you have a link for that, or is it really not worth looking at? As a collection, it's not all that huge. A lot of people here have far more than 1,091 sets (I've got several thousand myself). But what was impressive is that he built them all at the same time. He had them spread across different rooms of his house, and got the Guinness Book of World Records to come in and record it. The most sets I've ever seen assembled at once was probably a few hundred at a LEGO convention-- having more than 1,000 takes up a LOT of space. I am on a strictly build 1,display for a while, build another one, take down the first one before you even think about getting out another one. Rinse and repeat. The only time I got away with more than that was with the Christmas sets as the whole place was full up anyway. @davee123 , "record" or not, it looks like crap. I understand, in this case, it was for "record" purposes, but if you can't display a collection properly; why bother displaying it? My kids destroy what I build pretty quickly. 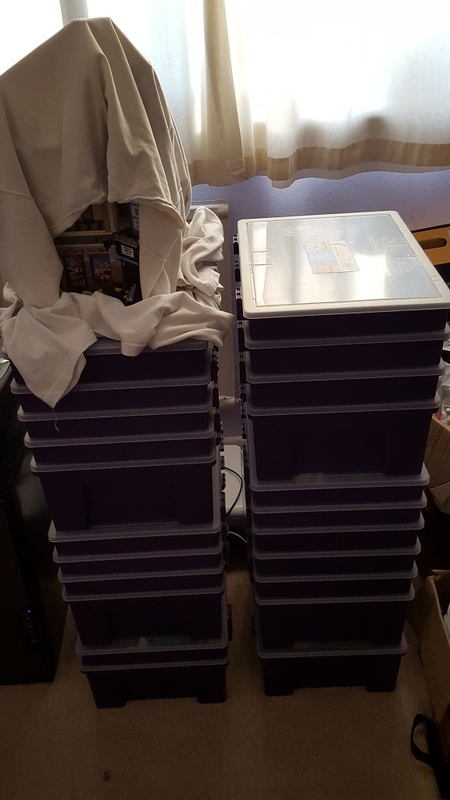 Once they destroy a set beyond recognition I put it into storage bins. I'll try to get a funny pic up later tonight on what our Lego table looks like. Pretty humorous mix of nonsense with combined sets. It's enjoyable to see what a 2 and 3 year old do with Lego sets. I try not to "Lord Business" them too much. (1) For setting the record, of course! I get the impression that he had a rather empty house, and figured this would be a fun record to set. So he filled up every flat surface he could find with sets, and set the record, because it was an accomplishment in and of itself. And then he probably took down 90% of them, because yeah, it just didn't look good, and most likely made his house difficult to live in! (2) For record verification. I did that once! 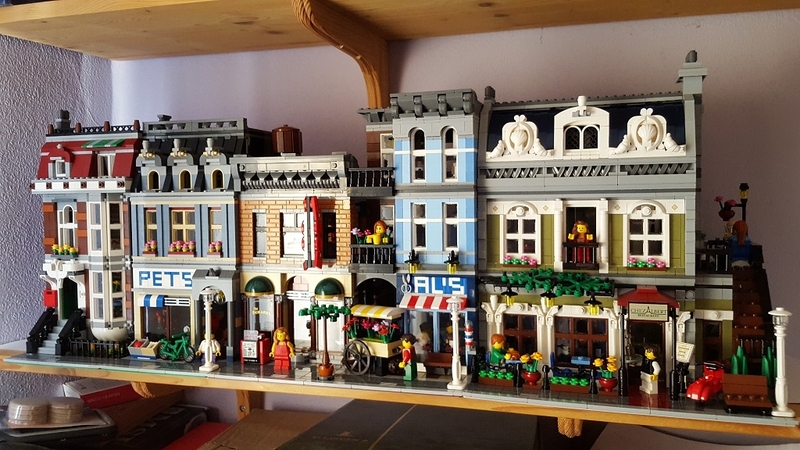 When I still had around 100-200 sets, I built them all once to see what I was missing, and what sets I really had. It was actually enlightening, since I managed to figure out that I had 2 copies of 6861 X-1 Patrol Craft, as well as 2 copies of 6804 Surface Rover, rather than 1 each. I had apparently thrown out or otherwise lost the extra instructions for them, so I didn't realize I had 2 copies until I realized I had leftovers to build those 2 exact sets. Anyway, I certainly won't ever try that again! Same here. A random pile on the floor isn't a collection to me. now you going to hate me, the older and bigger spaceships set's from 1998 give or take 1 year, i got on sale for 50% off RRP. Nice set of Lego Chris. That photo with 1000 sets just looks a mess! I love some of the layouts people show on here. If we ever get a Lego room I'm going to pay one of you to come and make me a Lego village. Although if I get all the sets out at once I think I'll achieve the divorce. At the moment they are hidden everywhere and as we only have four rooms in the house we only have a few out at a time. Hey, that's how I finally started getting big sets too, in my late teens - god bless the local Toymaster's hefty discounts, and my lack of other expensive tastes at the time! most of what i have here is new stuff, only the ECTO 1, the boat, and the lego movie set i had before. i know the boat is out of the way there, but it more just put there then on display. now that is funny, it was a toymaster i got my 50% off sets from. Only the Mightiest Hamster is worthy. How about adding some buildings to your vehicle-dominated collection? what do you call the kwik-e-mart? o i have some, i have 2x #10218 pet shop. i even have one that is missing parts. that remind me i need to do a missing part's count on that one. still got the 16x32 base plate. and 1 door, but i know the roof windows glass is missing along with the other door. i am not without house's / building's it just i dont have a lot of them yet. did not know you could do that cool. 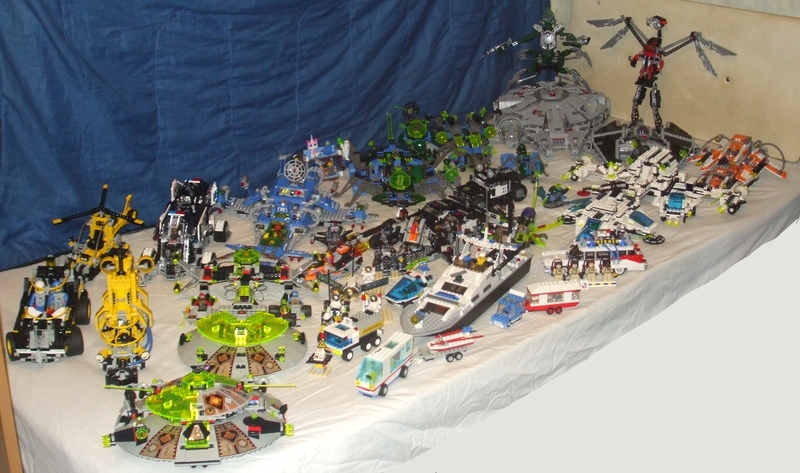 I had a metric f-ton of legos when I was a kid. My brothers and I would would spend all of Friday night and Saturday building armies of Castle and Pirate sets and Sunday would be the giant battle. Now that my son is old enough to start playing with them, "we" have been acquiring sets like crazy. He just wants to blow everything up though and I spend my time going around fixing everything. My wife had the audacity to suggest we kragle some things. She just doesn't understand. I'll have to take a pic when I get home. why it look like the death star is about to fall off? Rebel Scum are messing with the wall fasteners. I forget, did the first Death Star blow up because of a shelf failure? I'm more confused why the Y-Wing is doing a proctology exam on the X-Wing.